About 1,000 students and locals pack Goldstein Auditorium to hear the Vice President discuss college affordability. At 10:35 a.m., an official looking man came to the podium, rattled around some papers, and walked off. The crowd quieted down and the jazz music coming from the speakers of Goldstein Auditorium became audible. Realizing that the scheduled program was only five minutes behind schedule, the chit-chat in the room resumed. The Vice President of the United States is allowed to be late. Vice President Joe Biden speaks to an audience of 1,000 in Syracuse University's Goldstein Auditorium on Sept. 9, 2009. As part of a round table discussion on strengthening the middle class, Biden spoke about the need for affordable secondary education. Twenty minutes later, more officials began walking onto the stage. An announcer introduced Vice President Biden as he emerged wearing a Syracuse tie and looking impressed with the turnout. A roar of applause came from the audience, with some “whoos” thrown into the mix. Syracuse University Chancellor Nancy Cantor was introduced and spoke about Scholarship in Action, college affordability, and leveling the playing field for young Americans. “Get up and get engaged,” Cantor said. These were members and supporters of the Say Yes to Education initiative – an organization working with SU and the Syracuse community to further education for the past year. As part of the Say Yes program, 250 SU student volunteers mentor children in Syracuse public schools starting in kindergarten. They staff after-school programs and summer camps, as well as working with students one-on-one. “The goal of Say Yes is to remove barriers that impact kids going to college,” Rachael Gazdick, the executive director of Say Yes to Education of Syracuse, said. “Last year, every senior who was a resident of the city of Syracuse and attended the Syracuse city school district for 10th, 11th and 12th grade was eligible for free college tuition at 23 private schools as well as the entire SUNY/CNY system.” Students had to be accepted through the regular admissions process to qualify. Vice President Biden’s visit to SU was a sign of recognition and affirmation of the work that the members of Say Yes have done. During the Vice President’s speech, he spoke about fulfilling the promises that he and President Barak Obama made during their campaign. 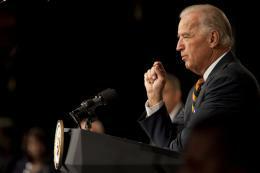 Quoting his wife, Biden said that if other countries out-educate us, they out-compete us. “Children tend to become what you expect of them,” said Biden, repeating himself to make more of an impact. He discussed future plans for college affordability and what the United States could do to prepare children for higher education. He and President Barak Obama are aiming to have the highest proportion of students graduated from college in the world by 2020. Following Biden, Secretary of Education Arne Duncan spoke about his goals of dramatic and fundamental reform in education. He called it the Civil Rights fight of this generation. Duncan thinks that if students work hard, the money for a college education should be available to them. But money alone is not the answer for improving education in America. Duncan thinks that courage and an improved outlook about sending children to college, despite financial setbacks, are also components to the fight to improve education. The Say Yes organization and the city of Syracuse could be a national model for a community coming together in education, says Duncan. The progress in Syracuse gives Duncan hope about the future of the education system in America. Following the speeches and discussion in Goldstein Auditorium, Duncan planned to meet privately with members of Say Yes to discuss their initiatives and progress in the Syracuse area. The Birth of "Big Boeheim"